The Kellys & O'Kellys was not published in instalments, so I am just following the original volume pattern. The Folio Society edition provides three full-page illustrations for Trollope's first five chapters, and three for his second, six for the first volume. They are drawn by Alexy Pendle whose name I have seen before; they are much more detailed, more thoroughly realistic, more carefully shaded and etched than the modern illustrations for the Folio Society Is He Popenjoy?, Ayala's Angel or John Caldigate. The figures or drawings of the people loom much larger, and remind me more of the original 19th century visualisations. All three center on the Michael O'Kelly story. expressed themselves positively certain of the result of the trial, and of the complete triumph of O'Connell and his party. To these pleasant certainties Martin added his conviction that Repeal must soon follow so decided a victory, and that the hopes of Ireland would be realised before the close of 1844. John was neither so sanguine nor so enthusiastic; it was the battle, rather than the thing battled for, that was dear to him; the strife, rather than the result (Folio Society Kellys & OKellys, illus Alexy Pendle, p. 13 and facing illustration). In this coming week's chapter there are a few references to this trial which did not result in an unambiguous triumph at all, nor did Repeal soon follow. The use of the law to intimidate and to bully which we see in Daly and Barry Lynch parallels the government's attempt to intimidate O'Connell and all who supported him. This is a significant device and theme in this book: characters defy and threaten one another, and we see that underneath a veneer of manners what counts is who can win at games of threats (Mrs Kelly doesn't flinch) and who is too soft and sensitive to counter someone else's stonewalling (Ballindine has not the cunning self-control of Blake, the denseness and pragmaticism and loses out against the greed and determination and psychological stupidity of Cashel). "it's not that things are out of their place, for they have no place. It isn't that the floor is not scoured, for you cannot scour dry mud into anything but wet mud. It isn't that the chairs and tables look filthy, for there are none. It isn't that the pots and plates, and pans don't shine for you see none to shine: all you see is grimy, black celing, an uneven clay floor, a smal darkened window, oe or two unearthy-looking recesses, a heap of potatoes in the corner, a pile of turf against the wall (p. 43 and falling illustration). The difference between this description of a kitchen and one in The Macdermots is not that The Kellys slides over the realities of Irish life, but that Trollope presents the truth in a tone of someone slightly amazed to see how people can get on this way. Irish culture is central to this book. The third picture matches the first in that we have two women walking together: one leans on the other. The caption reads: "As she was leaving the gate of Dunmore House, with Anty on her arm, she was already beginning to repent what she was doing". In some ways this is the most alive of the three: the look in the older, somewhat heavy blonde woman's face (Anty) as she leans on the arm of the grim thinner darker woman (Mrs Kelly) is one of withdrawing back, discomfort, anxiety, uncertainty. Here we have Anty walking forth on the arm of Mrs Kelly, away from the house where beating and murder await her, exploitation, bullying. Yet she is not eager to move forward; she feels some trepidation. Mrs Kelly looks grim as she stares ahead. The two women have shawls; they are plainly dressed with close caps on their heads. They have rings round their eyes; the sky looks like it is just lightening. The house behind them is white, large, not fancy, but substantial; behind them are dark trees, a sliver of a moon in the sky. We are told that Mrs Kelly's feelings of "dubiety" "vanish the moment she had cross her sill" (p. 61), and when Barry comes in, she gives as good as she gets; still the law is apparently on his side. All you need is sufficient unscrupulousness -- which quality is winning out in the state trial. 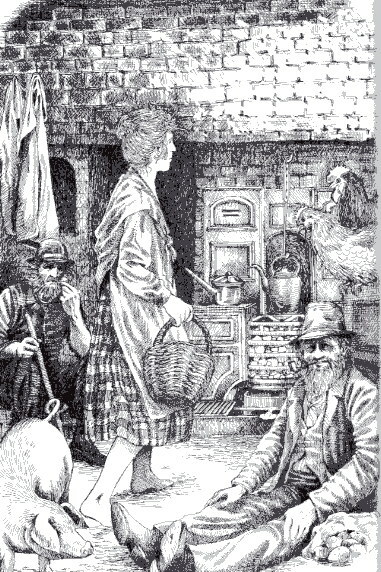 The pairing of the brothers in a conversation about the state of Ireland and how they really respond to politics; the picture of an inn kitchen; the two women walking unsteadily ahead -- they encapsulate as well as reinforce some of the books concerns: one is the weakness of women in this culture. Lord Cashel may not literally beat Fanny Wyndham, but he attempts to subdue her through strong argments. Like Barry and Martin vis-a-vis Anty, he (and his heir) will want Fanny's property. Mrs Kelly is unassailable in her kitchen, behind her counter, but apparently no where else. The illustrations for last week move us away from the Michael O'Kelly characters, and again seem picked to give us a feel for "Irish" life. The theme or paradigm which seems to dominate the book, that of negotiation, of how people interact through continual bargaining and intimidation, through the use of verbal insinuation and hard-ball stonewalling, whereby the weaker, more vulnerable and sensitive go to the wall or simply loss the bargain, and the cunning, stronger, more determined or more powerful (those with the law on their side) is kept up in all three. This is not deliberate on the illustrator, Alexy Pendle's part: there doesn't seem to be a scene in last or this week's instalment where people are not "at" one another in some way, manipulating, demanding, inveigling -- or, in the case of Anty Lynch and Frank Lord Ballindine who seem oddly paralleled in this book, trying to escape their opponents, in Frank's case, first Lord Cashel, and in Anty's just about everyone, including her suitor, Michael OKelly. The first illustrator shows us Barry Lynch just after he leave the widow's tavern. The caption is "Barry now took himself off, before hearing the last of the widow's final peal of thunder". We see a youngish man walking off with his face all vexed; he holds his body in a show- offy way, his cane pushed outward; he is puffing himself up with his stomach (covered by a fine waistcoat) firmly forward, his (gloved) hands holding onto a fine outer long coat. But the reader who has just read the scene is not fooled: he had the worst of it. To my eyes the figure of Barry is too thin, not coarse and mean and heavy enough, and the widow in the distance also too thin, too young. They are once again prettied up. The widow is also too sketchily drawn; she is seen in the shadows of her threshold. Trollope does tell us while she is queen over her territories, she is wise enough not to venture beyond them much. Alexy Pendle has, though, gone to much trouble to drawn the front of the shop, its many paned window, a barrel nearby, the cobbled street. We can see goods sitting in the window inside jars and squares and paper packages; through the window from the inside people look out at Barry. 'I've nothing more to say, since you insist on keeping possession of my sister', and Barry turned to the door. 'But you'll be indicted for conspiracy, so you'd better be prepared'. 'Conspiracy, is it?' said one of Mrs Kelly's admirers; 'maybe, ma'am, he'll get you put in along with Dan and Father Tierney, God bless them! It's conspiracy they're afore the judges for'. Barry now took himself off, before hearing the last of the widow's final peal of thunder. 'God out wid you! You're on good, and never will be. An' it wasn't for that young woman upstairs, I'd have the coat off your back, and your face mauled, before I let you out of the shop!" And so ended the interview in which the anxious brother can hardly be said to have been triumphant or successful" (Folio Society, Kellys & O'Kellys, illus Alexy Pendle, Ch 6, p. 74 and facing illustration). We see the violence of Irish life as Trollope felt it. The sense of this book is that (as opposed to English life which is probably the contrast in Trollope's mind), violence is near the surface, easy to provoke into iruption. It is not buried, repressed, kept back. She would have had him mauled but that his sister would look bad and feel bad about it. Another thing this passage shows us is how often Trollope links the outward political events to his private characters. He is continually making quiet little analogies. I will make a separate posting for each illustration. 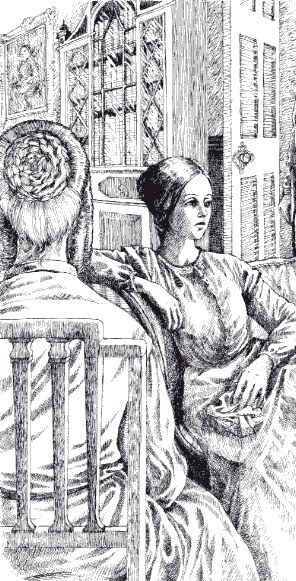 The second illustration focuses us on one of the many remarkably portrayed characters in the book: Dot Blake. We see Frank, Lord Ballindine on the left side of a horse whose head is at the top center of the illustration. Frank's face is turned to look up at the eyes of the horse; he is attempting to control its movement as it pulls away and up from his hands; he has, as far as we can see, an open eager expression on his face; like Barry he has whiskers lining his jaw but the center of his cheeks are shaven. This must have been the fashion at the time; his hair is dark (and is throughout all the pictures of him; he is dressed not too fancily; a gentleman's coat and trousers, slightly wrinkled; he has a graceful slender figure. Just behind his legs is a dog who looks cheerful. "He took very good care that he was never charged a guinea, where a guinea was not necessary and that he got a guinea's worth for every guinea he laid out ..."
"Dot was in his glory, and in his element on the Curragh, and he was never quite happy anywhere else (Folio Society, Kellys & O'Kellys, illus Alexy Pendle, Ch 8, p. 94 and facing illustration). Hitherto -- and I have read this novel at least twice -- I have never paid much attention to Frank Lord Ballindine; he always seemed to me just an early fresh sketch of the ne'er-do-well gentleman type we recently saw in Frank Houston (Trollope does like the name Frank for this sort of hero -- there's Frank Gresham, Frank Tregear). However, our slow reading -- this is the first time I have read the book slowly -- have made me see that Frank in this context emerges as sensitive, someone with an emotional life he doesn't quite understand but would make better if he could; with decent impulses, so decent that he loses out in the hard-ball nature of this book, a parallel to Anty, the heroine. Well I like him, sympathize with Fanny's love for him, her affection. As I read Johnny Eames, Johnny can play hard-ball (we see that in his encounters with everyone but Lily Dale, but especially other males), but not Phineas Finn: Finn loses out when pressured on the score of his good nature and generosity (remember he countersigns a bill); so too does Mark Robarts. Frank has his own unique personality, one home-y, but he relates to these heroes and to me is, along with Anty, thus far the most sympathetic and appealing figure in the book -- not the most interesting or vivid, but the most humanely appealing. Now for the parallel heroine. We have already "seen" Anty being brought to the inn by Mrs Kelly (the book's third illustration); the sixth brings us Fanny Wyndham, the "other heiress". I have reproduced but one portion of this richly-detailed illustration -- it recalls a number in Ayala's AngelM and The Last Chronicle of Barset where a room is filled in with objects. The sofa on which Fanny leans is pillowed and cushioned, stripes arne colours are seen. To Fanny's left we see the back of a woman who has blonde hair arranged in a style I have seen in adaptations of 1840s films which are historically accurate: the back is a kind of bun in the center of which the hair twirls; from the side of the head flaps of hair in the form of curls hang down. We see this from the back. She is blonde. The dress looks rich. This is Lady Selina, Lord Cashel's grim daughter who has just been telling Fanny what "a consolation" it should be to her to think about how her brother has died so he will not live "to be contamined by the heartless vices of that portion of the world into which he would probably have been thrown; he had not become dissipated -- extravagant -- and sensual [oh dear]. This should be a consolation to you". Fearing we will laugh too sharply, Trollope's narrator reminds us the woman means to be sensible, simply truth-telling and anyway "Fanny was thinking of something else before she [Lady Selina] had half-finished her speech" (Folio Society, Kellys & O'Kellys, illus Alexy Pendle, Ch 10, p. 119 and facing illustration). The caption for this picture is simply "In came the Earl". It's enough. This is Grey Abbey. As I look at the picture and think about the scenes, comic and hard that Trollope's words dramatize for us taking place in it, I remember Martin Kelly's statement to Anty: "to tell the blessed truth, I was thinking av' you too; and that you'd be happier and asier, let alone betther an' more respectable, as an honest man's wife, as I'd make you, than being mewed up there in dread of your life ..." (Ch 15, p. 180). Fanny is not in danger of her mortal life, just her happiness is at risk, that's all, and she too would be better off with Frank. Good parallel plotting enables the reader to apply important statements from one plot to the other. Last and this coming week's instalment have but one picture each in the Folio Society edition and they both place dramatic scenes of physical interactions between males at their centers. If there is such a thing as a novel dominated by male spirit, and one dominated by a female, this is one where scenes between males take up most of the action. When males are not dominant, they accompany, threaten, attempt to manipulate, or soften a female. 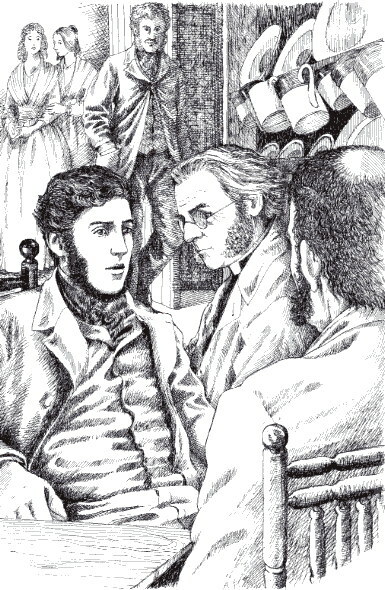 It is also a novel where Trollope seems intently taken up with Irish culture, the Irish milieu: Trollope makes a point of contrasting Daly's office with an analogous scene from a typical English attorney's office as he did Mrs Kelly's kitchen with a typical middle class Englishwoman's kitchen. Here we have a picture of what loks like a green damp rich landscape, and a picture of the Irish hunt run by Frank, Lord Ballindine. The caption for the first illustration is: "'And is that all you called me back for? '": "'And is that what you called me back for? ' said Martin,"The Kellys and O'Kellys We see the same solidly built, sturdy rather than heavy, blonde man striding long in a field; he is on the left; to his right, from the back is a man on a horse. Michael O'Kelly is the man walking along: he is dressed in dignified but not quite gentleman's clothes; a soft shabby hat, a kind of scarf around his neck, thick boots, plain waistcoat, tousers tucked into the boots; he looks irritated. Barry Lynch leans down from the horse; he has a top hat, fancy coat; the horse is a large black elegant animal. We see stone walls criss-crossing a field, trees to the back. Across from it is the dialogue between Michael and Barry where Barry again attempts to bully Michael into offering to give up Anty. This scene visualizes a key conflict in the novel: Barry v Michael OKellys is also paralleled with Lord Cashel Frank, Lord Ballindine (Folio Society Kellys &OKellys, illus. Alexy Pendle, Ch 15, p. 174 and facing illustration). The caption for the second illustration is: "And now the business began". This coming week's chapters end in a hunt: the hunt among the Anglo-Irish and Irish establishment in Ireland was perhaps more important as a class and leisure element than it was to the English in England. Trollope says as much in his An Autobiography, and in The Landleaguers we see that the tenants see in it a symbol of their oppression, exploitation, the advantage taken of them, and central to their boycott is their taking to the fields to prevent landlords from hunting. The subtitle of The Kellys & O'Kellys is Landlords and Tenants, though in this early book relationships between these two sides as such are harmonious; it's people who don't fit in, the overly corrupt (Kilcullen), and the vicious, ruthless and spitefully coarse (Barry) who are to be ejected. By tomorrow all those who are reading along by the schedule will know that Barry is another of Trollope's "inferior" gentleman to show himself to be not worthy, below others, by mismanaging a horse and causing the death of an animal. 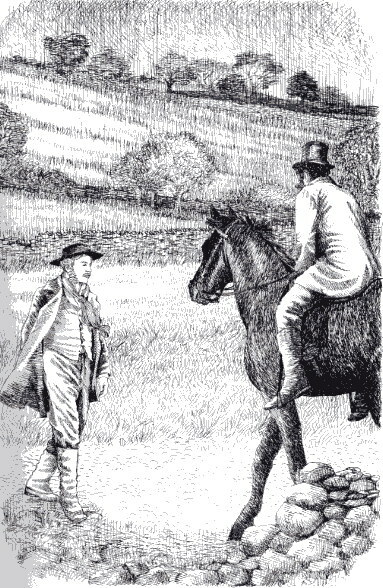 The scene is one I have seen in countless paintings and prints: the English gentleman on horses in their resplendent or relaxed riding outfits, the large handsome and elegant horses, dogs surrounding them; in the left background a large house; to the right a wood (Ch 20, p. 231 and facing illustration).